Next Post What Do You Do With 11-to-13-Year-Olds? “Don’t ask, it’s axiomatic” I’m DYING!! 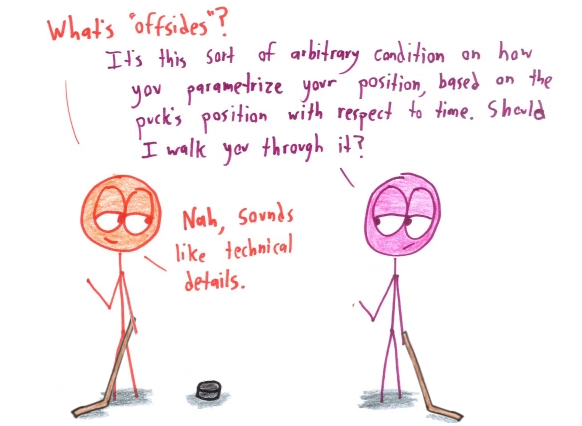 Hockey is the most amazing sport, and this comic properly identifies the most commonly asked question from a person learning the game. I laughed to tears. Brilliant, insightful, and a lot of fun!! Well done!!!! Soccer is played with a truncated icosahedron, with a symmetry group isomorphic to A_5, So it has that going for it. That is not generally true, particularly not for modern soccer balls. Since 2006, the official FIFA World Cup ball has not had that symmetry group (2006 was tetrahedral, 2014 octahedral). Premier League uses a dodecahedral ball. Thanks a lot for sharing such a very funny and fantastic post. I really like to appreciate it. Keep posting more update. That’s my excuse for not playing Tennis too! Hilarious stuff. Smug face is perfect.